Jeffrey Welch's Blog: Is Your Dog a Fashionista? Embrace These Fall Trends! Is Your Dog a Fashionista? Embrace These Fall Trends! In the past, pet fashion trends were a few years behind human trends. This fall, pet fashion is keeping up and even setting some trends of its own. From pairing black with white to a regression to the 80s, this fall has something stylish for dogs of all personalities. When Elle Magazine held its fall fashion show, one huge trend was black and white together: stripes, checks, and blocks are all par for the course this year. 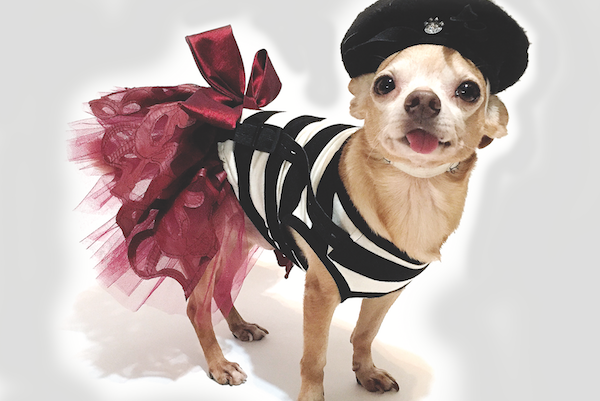 Pair this with a pop of color like designer Lola Tiegland of Lola Couture d’Chiens does with her French inspired collection to create a standout look for your fur baby. Photo courtesy Lola Couture d’Chiens. As usual, the Met Ball brought out creativity that made fashion headlines. The major standout — Claire Danes’ light-up gown — ushered in a techno trend for fall. Techno has been trending in pet fashion since an LED light-up dress hit the runway at the 2014 New York Pet Fashion Show. That dress was created by Ada Nieves for Pets, who partnered with designer Glady Delgado-Garced. Ada Nieves now has a full light-up line called Fireflies sure to make your pooch the center of attention. A throwback to 80s fashion is also on fall’s horizon, but hold the legwarmers. This decade ushered in the rocker punk trend that’s making a comeback. Karen Varley of PJNY Dogwear debuted her rocker spike collection at this year’s New York Pet Fashion Show. If a more girly glam punk look fits your pup’s personality, you’re in luck because the Cyndi Lauper-type punk look with a feminine flair is definitely in. The post Is Your Dog a Fashionista? Embrace These Fall Trends! appeared first on Dogster.